Damn Yankees (along with Ted Nugent and Tommy Shaw from Styx) and Night Rangers legendary front man and lead vocalist/bass player/songwriter/producer Jack Blades releases a new solo album 'Rock 'n Roll Ride', which features contributions from Blades’ Night Ranger band mates Brad Gillis, Kelly Keagy, Joel Hoekstra and Eric Levy, as well as a special guest appearance by Cheap Trick’s Robin Zander. He has a self-titled solo album from 2004 in his history besides his discs with DY and NR. 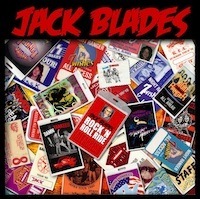 'Rock 'n Roll Ride' is packed with classic rock in top class and the gut feeling kicks in already from the first bomber track 'Back in the Game' where Jack and his pack 'owns' with superb catchy American rock n roll. It rolls on with the title track and I am convinced when we reach 'Born for This': This a great AOR album for all the fans in this genre. I loved the latest NR's album 'Somewhere in California' (and looks forward seeing them live this summer btw) and many of the songs on this album holds same high level and it could be another NR album, but on RNRR Jack has more space for his singing ability and it's little softer or should if I say: little more in a American radio friendlier manner than the sound in NR. Still it's a mature rock disc that holds the line and quality all the way to the end. Packed with awesome melodies and a perfect production, it creates an overwhelming frame and Jack has filled it with some timeless sweet rock-candy bars. It's just to grab one and take a bite.